On May 4th, four Minnesota natives set out by ferry from Bellingham, Wash., for Skagway, Alaska, where they began a 135-day canoe expedition from the headwaters of the Yukon River to the Hudson Bay. 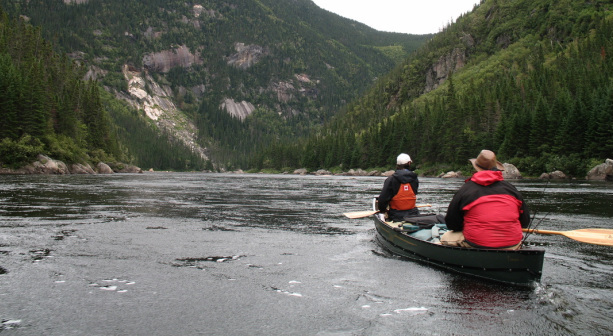 The mission of the Trans-Territorial Canoe Expedition is to combine outdoor recreation with wilderness conservation. Consisting of four members, the expedition is thought to be the first of its kind to follow a route from the Pacific Ocean to Hudson Bay via the Yukon, Pelly and Ross and Mackenzie Rivers by canoe, and the first expedition to undertake this route. Long canoe trips in isolated regions of North America are nothing new for the team of Pete Marshall, Winchell DeLano, Steve Keaveny, and Matt Harren. Members of the expedition have paddled to the Arctic Ocean and Hudson Bay several times, including a 2,700-mile journey from Minnesota to the Arctic Ocean in 2005 by Marshall. The expedition aims to promote proper environmental stewardship and advocacy within the greater outdoor community. The crew hopes the trip will promote awareness of the role responsible recreation can play in conserving Canadian rivers and perhaps those through out the world. The 2012 Trans-Territorial Canoe Expedition is a bold, 2,600-mile canoe journey through the remote wilderness of Canada’s territories. Keeping these river systems and expedition routes navigable and pristine is important to all paddlers, outdoor professionals and conservation and adventure enthusiasts. In 2009, the crew plus two others canoed down one of the most famous and challenging arctic rivers, The Back River. Over the course of 45 days they encountered frozen lakes, whitewater, wolves, caribou, grizzly bears and muskox. The trip ended with the crew stranded on the Arctic Ocean. They produced a documentary film about the trip available on their website. The 2012 Trans-Territorial Canoe Expedition team will rely on Kokatat GORE-TEX® dry suits and PFDs (personal flotation devices) as they traverse Northern Canada. “This expedition will encounter extremely cold water and potentially dangerous conditions and we’re proud that they have selected Kokatat to keep them dry and safe,” said Lisa Kincaid, Promotions and Sponsorship Manager at Kokatat. The project was funded successfully through a Kickstarter campaign and readers may also follow their progress at Canoe&Kayak magazine online. For more information on the expedition, the team members, and the route visit www.canoe2012.com.